Spirit Airlines’ network evolution so far in 2014 reflects its declarations of connecting the dots between various points in its route network established during the past few years as it has made a push into larger metropolitan markets that are dominated by legacy carriers. The airline has rapidly grown from Dallas/Fort Worth (DFW) during the past couple of years, and added eight new destinations from the airport during CY2013. But in 2014 DFW seems to have featured less prominently as Spirit sets up shop in Kansas City and adds more service from legacy strongholds in Chicago, Minneapolis and Houston. For the moment it seems Spirit has no aspirations to captialise on legacy airline pull-downs in Cleveland and Cincinnati, as other carriers including Frontier move to backfill some of the capacity cuts initiated in those markets. Instead of picking fights with other ultra low-cost carriers (ULCCs), Spirit is working to stimulate traffic in other areas it deems as ripe for its lower base fares. Spirit’s growth story during the past few years is now quite familiar. After establishing its ultra low-cost model in South Florida on routes to the Caribbean and Latin America, Spirit spread its wings into the US domestic space. Fort Lauderdale remains its largest base, but Dallas, Chicago and Las Vegas have quickly become staples in Spirit’s network. Dallas in particular became a target for Spirit after its ULCC strategy proved fruitful in South Florida. American is the dominant carrier in Miami (42 km away from Fort Lauderdale), and Spirit arguably succeeded in stimulating the region’s ethnic passenger base that found its significantly lower base fares (USD78 in 1Q2014) attractive. Even though Southwest is based at nearby Dallas Love Field, Spirit saw an opportunity to target passengers at DFW that were priced out of air travel given American’s dominance at the airport. 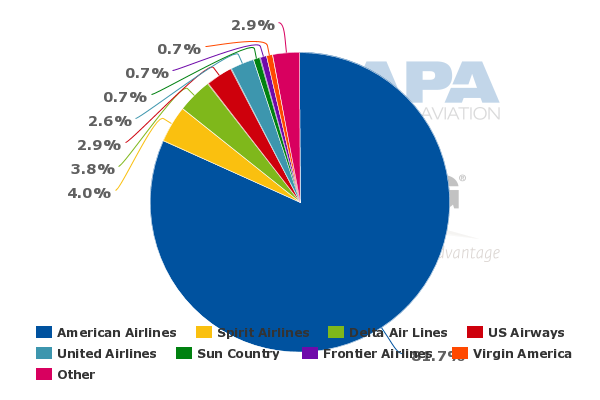 Even as Spirit has moved to become DFW’s second largest carrier measured by seat deployment, it still only represents a 4% share, well shaded by American's dominance. During CY2013 Spirit introduced service from DFW to New Orleans, Minneapolis, Philadelphia, Los Angeles, Cancun, Los Cabos, Latrobe and Oakland. Spirit’s other routes from DFW include Baltimore, Boston, Chicago, Denver, Detroit, Fort Lauderdale, Atlanta, Las Vegas, Myrtle Beach, Orlando, Phoenix, Portland and Tampa. Spirit re-entered DFW in May-2011 with flights to Fort Lauderdale and Las Vegas. Its passenger numbers at the airport jumped 63% year-on-year in CY2013 to two million. Of course, that is just a small fraction of the passengers transported by American, but on a pure numbers basis it reflects Spirit’s market stimulation capabilities. Through 1H2014 Spirit has announced plans to introduce service from DFW to Kansas City in Aug-2014, as part of the airline’s push from Southwest-dominated Kansas City. Spirit is launching service to its largest markets – Chicago, O’Hare, DFW, Houston and Las Vegas. 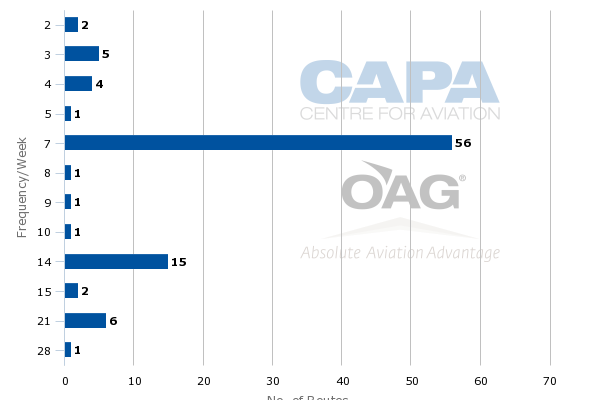 As previously reported by CAPA, Spirit will compete with Southwest in two of its new markets from Kansas City – Chicago (Southwest serves Chicago Midway) and Las Vegas. At Chicago O’Hare it will compete with American and United, American at Dallas/Fort Worth and United in Houston. Spirit generally offers fewer frequencies in markets where the airline competes with legacy carriers. Roughly 56 of its domestic markets average seven frequencies per week, reflecting Spirit’s logic to offer just enough capacity in its markets to stimulate traffic rather than steal passengers from legacy airlines. Spirit’s other areas of focus so far in 2014 are Minneapolis, where it has introduced service to Baltimore, Detroit, Houston and Chicago with new flights to Oakland, Baltimore and Portland. The airline also is expanding in Houston, a market it entered in Sep-2012 with service to DFW that was quickly axed. Spirit presently operates service from Houston Intercontinental to Denver, Detroit, Las Vegas, Los Angeles, Orlando, Minneapolis and Chicago. Starting in Aug-2014 Spirit is introducing service from Houston Intercontinental to San Diego, Fort Lauderdale, New Orleans and Kansas City. All of those routes are served by United from George Bush Intercontinental and Southwest Airlines from Houston Hobby. Spirit’s raft of new markets from Houston indicates that United, Intercontinental’s largest carrier by a wide margin, is essentially leaving Spirit to its own devices – for the time being. When Spirit debuts its latest round of services from Houston it will account for only 11% of the seats on offer from New Orleans, 17% from Fort Lauderdale, 16% between Houston and San Diego and 33% in the Intercontinental-Kansas City market. Those shares reflect Spirit’s strategy of attempting to capture new passengers rather than compete with legacy carriers. Spirit could also be luring a few passengers away from Southwest. Even factoring a checked bag at the high end of Spirit’s pricing range for one checked bag, USD21 to USD40, Spirit’s fare including a checked bag (USD79 plus USD40) would be lower than Southwest’s average fare during 1Q2014 of USD159. Spirit’s broadening of its reach (it aims for 30% capacity growth in CY2015) means it will increasingly encounter the no-longer LCC Southwest, which is feeling some pains of middle age as it works to determine how to position itself in a US market where hybrid, ULCCs and legacy carriers are working to solidify their respective places within the industry. At this point Spirit has opted not to backfill some of the capacity United Airlines has cut in its Cleveland hub. Spirit may feel that the Cleveland market is too small, or it may be avoiding Frontier Airlines, which is making a huge push from Cleveland in CY2014 in the wake of United’s pull-down. Spirit has also not attempted to backfill Delta’s cuts in Cincinnati or Memphis, where the legacy carriers has made significant reductions during the past couple of years. 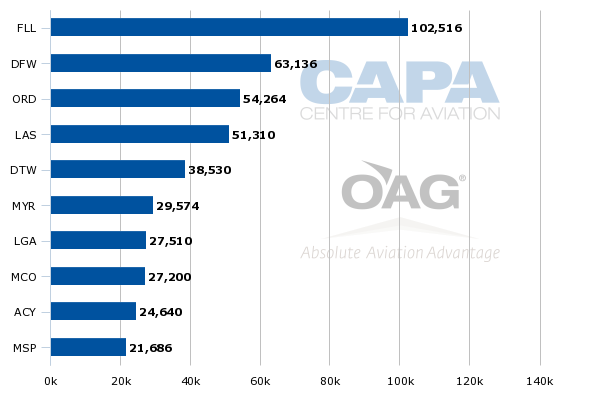 Cincinnati and Memphis were ranked second and 14th, respectively, by the US Department of Transportation in its 4Q2013 rankings of airports with the highest average domestic fares. Those markets may be on Spirit’s radar, but during its push from Dallas, Chicago, Las Vegas and Houston during the past few years the airline has cut only a few markets, so perhaps the airline’s goal for the time being is continuing to stimulate traffic in more populated US markets. Whatever shape Spirit’s route network takes in the future, it consistently drives home the point that it will only account for roughly 5% of US seats by the end of the decade compared with a current approximate share of 1.4%. So far the network moves by ULCCs Spirit and Frontier in 2014 show that presently ample opportunities exist for each airline to grow in the consolidating market place. But at some point those airlines will meet more frequently, which will be the real test of the viability of two burgeoning true ULCCs in the US market place.